Social proof is the most important factor that drives conversion rate effectively. However, it isn’t really popular with Magento 2 users. They do not know what social proof is and how to get it. In this post, we would like to introduce an extension that can be the best tool to gain social proof and customer trust, it’s Magento 2 Product Images by Customer extension. 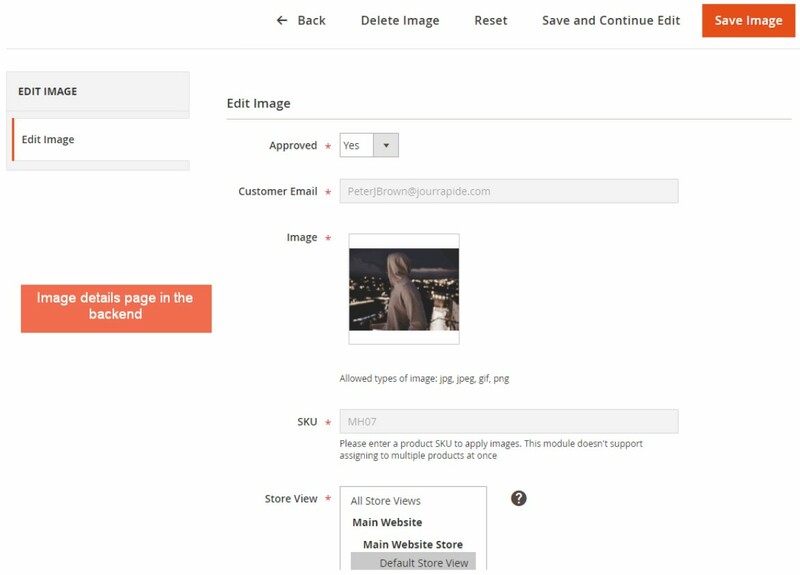 Using this module, your customers can freely upload their photos to product pages to share with others. 0.2 Does Magento 2 Default Support Customer Product Images Function? 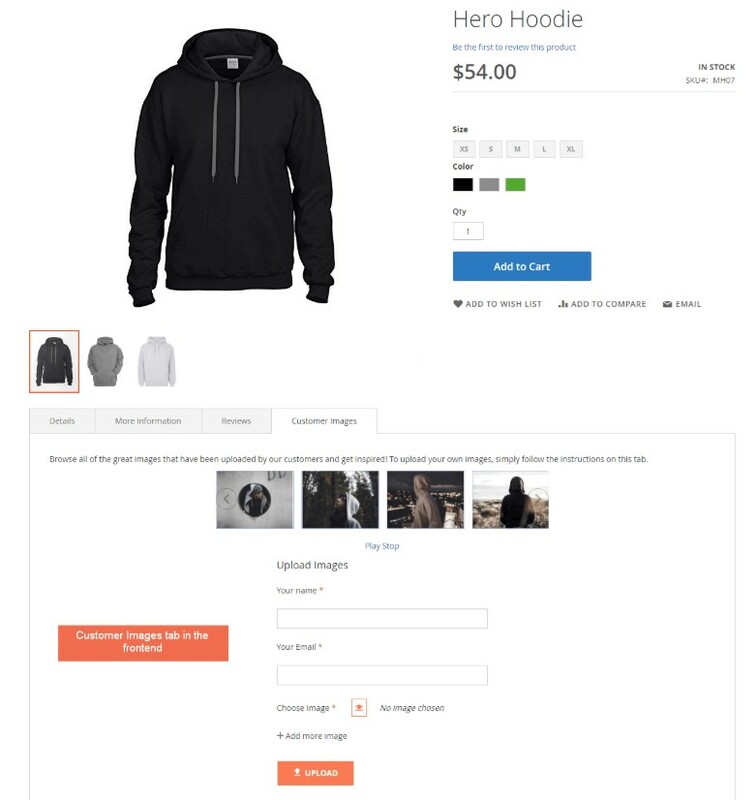 0.4 How Does Magento 2 Product Images by Customer Extension Benefit You? 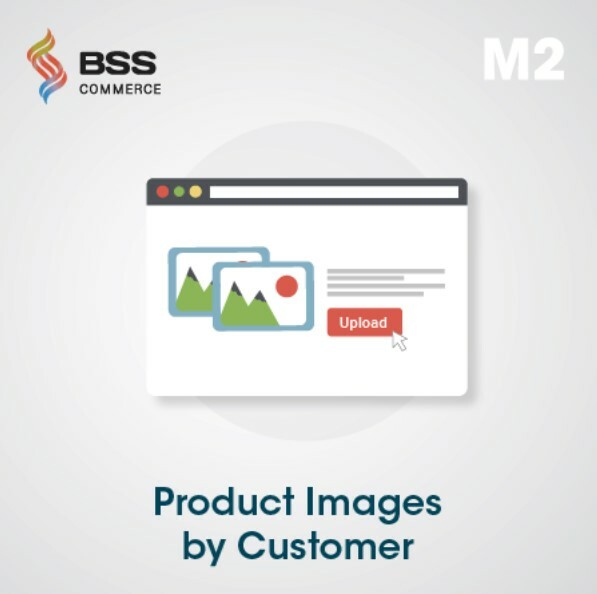 BSSCommerce Customer Product Images extension for Magento 2 makes your product more visual and user-friendly. Any customer can submit their images to product pages on your site. 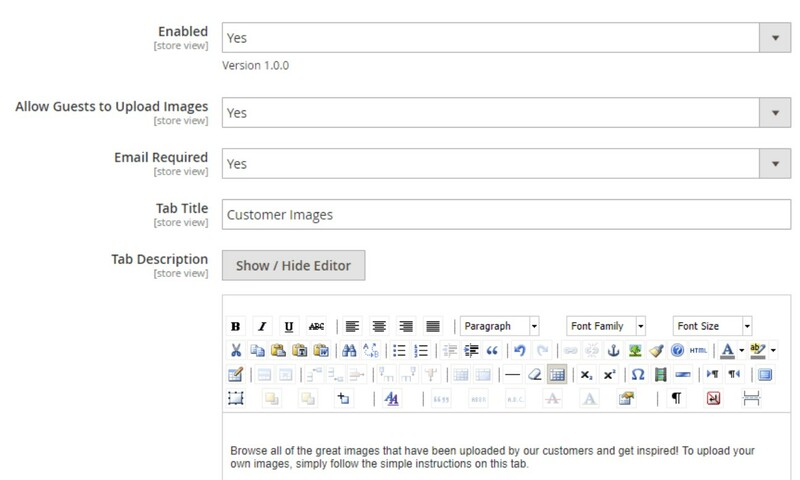 The uploaded pictures must be approved by an admin in the backend management to be enabled in the frontend product pages. All customer product images will be shown on an eye-catching pop-up slider. Moreover, the admin can set up the image size and restrict display by store views easily. 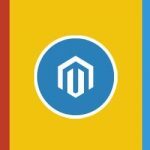 Does Magento 2 Default Support Customer Product Images Function? It’s a pity that default Magento 2 doesn’t support this useful feature. Customers are only allowed sending the reviews of the product when they want to share their feedbacks to store owners. It also can’t meet the buyer need of referring proofs to make the purchase decisions. 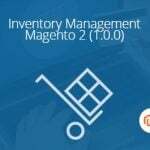 Hence, we developed Magento 2 Product Images by Customer extension to improve product content. 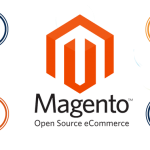 How Does Magento 2 Product Images by Customer Extension Benefit You? Both store owners and buyers can take many advantages from the extension. The seller will control the amazing social proof and get more trust for products to make more sales. 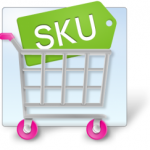 Purchasers may not wonder about the qualification of items and order them without hesitation. With so many benefits mentioned above, let’s check all functionalities of this Magento 2 Customer Product Images extension in details! Please go to Admin Panel → Store → Configuration → BSSCommerce to set up General Configuration. You need to choose Yes in Enabled filed to turn on all features of this module. Then edit Tab Title and Tab Description to identify customer product images tab in the frontend product page. In Allow Guests to Upload Images, if you change the option to Yes, both guests and registered customers can upload photos to product page; and No to allow registered customers only. To force users to submit email when upload pictures, you can select Yes in Email Required. To set how the images presented on the frontend, you must press Display Settings section. Let’s begin by setting Slideshow Speed and Number of Images per Slider. Then, you can customize the dimension of the picture to be displayed in a slider and in zoom mode. To avoid users spamming, this module allows you to set up Limit Number of Uploaded Images at Once, simply enter a number in the blank field. You need to explore Email Notification block to set up alert email of customers image upload by enabling the function, choose email sender, receivers and a template. After setting all configurations, you have to press Save Config button to complete. 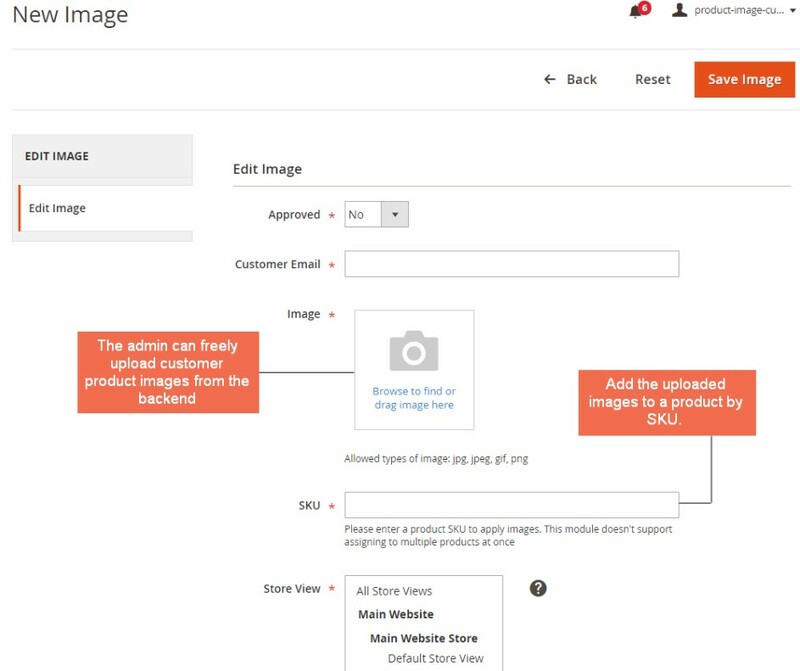 The important part of this module in the backend is Image Management, please navigate to Marketing → Customer Product Images Management. This grid includes all uploaded images with general information. You can filter, take mass actions (delete, approve, not approve) on them. For detailed management, please click on Edit link in Action column to go to the image edit page. On this page, you can change the Approved set up to Yes to enable the image in the frontend; view customer email, uploaded image, product SKU; and choose to show in specific store views. 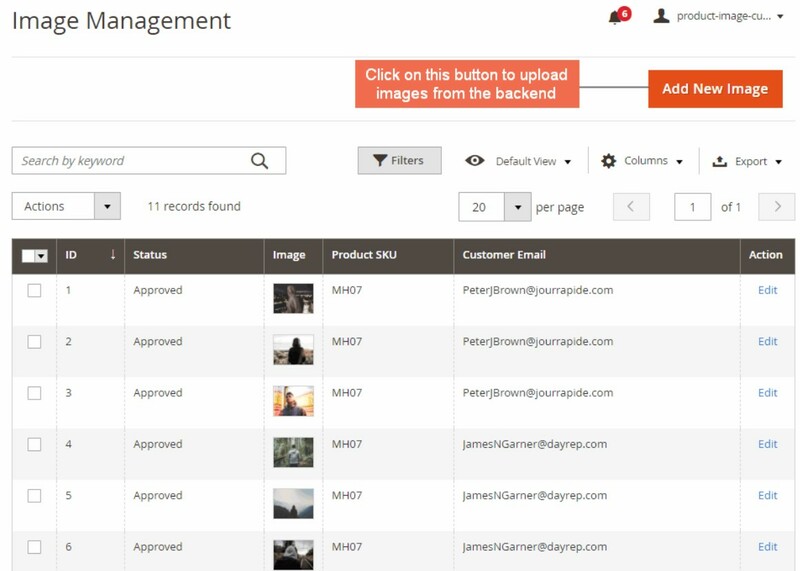 Moreover, the admin can freely upload customer product images from the backend by clicking on Add New Image button in the Image Management page. In the frontend product page, the product photos uploaded by customers will be presented on a new tab. The instructions for buyers to upload images is also displayed on this tab. 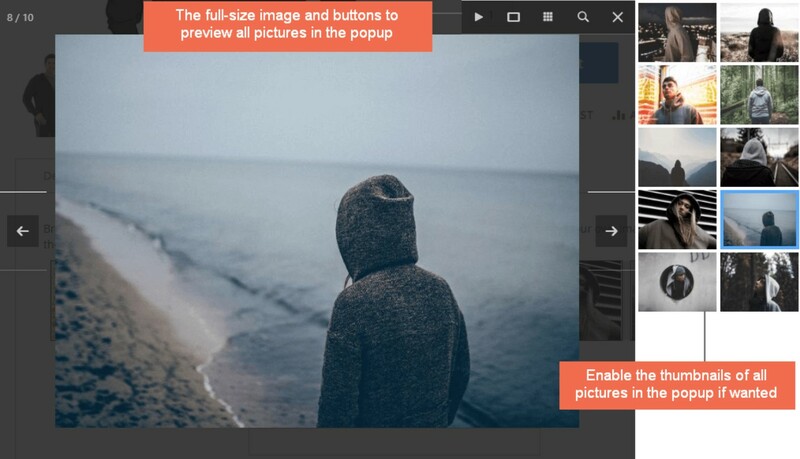 When a visitor clicks on a picture in the slider, a popup will appear to show the full-size image. Magento 2 Product Images by Customer extension is the perfect tool to improve the unique and visual content of products. You also get more customer trust and keep interacting with customers. We provide this useful module with only $79 for Community Edition and $100 plus if you want the Enterprise version. We still attach the outstanding support policies: Free 1-Year Support | Free Update | Free Installation | 30-Day Money Back to each ordered module.